I love when weekends like these come around. Ya know, the awesome ones that go down in the memory books as great weekends. Ty and I went to his Fire Fighter's Installation Banquet on Saturday. Some of you might not know that Ty has been a firefighter since he was 18 years old. He now volunteers here in New York. We had so much fun! We genuinely laughed and laughed like we haven't in a long time. I can't say it enough times, date nights are SO important. It's one night every once in awhile when you aren't Mommy and he isn't Daddy. You are just two people who fell in love with each other. That's really important for a marriage or relationship; that alone time where you can reconnect without disruption. Saturday night was nothing short of absolutely fabulous. 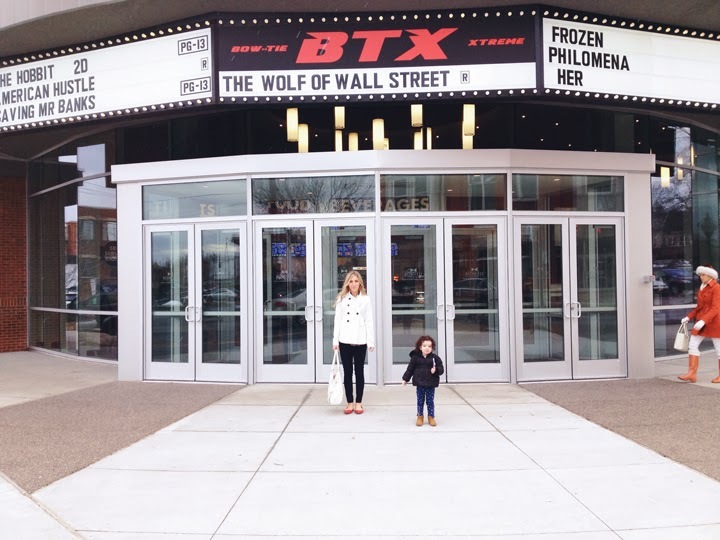 Sunday, we took Scarlett to see her very first movie at the Theater. I have been looking forward to this all week. She did very well, as I expected. She's a movie buff. We saw Frozen. Lots of singing and two princesses were details from a movie that Scarlett gave 2 thumbs up. She didn't even flinch when the giant, scary snowman part came on. Possibly reading the book a few times helped prepare her. We came home and Ty helped me make my first ever all organic home-made Chicken Pot Pie. All of you remember that I hate cooking right? Well, this girl made the most delicious pot pie I think I've ever eaten! I'm tooting my own horn on this one…..Maybe a recipe post later??? I'm so happy that I have been taking the time to make some healthy recipes lately. Although I'm really not ready for the week to begin yet, we are all settled in at home preparing for work/school in the morning. The house is clean and the laundry is washed. Lunches prepped and I'm enjoying a bowl of chocolate ice cream while I write this. Hope you all had a great weekend!!! Bottom left photo^^^ Ty's reaction to "Let's take another!" I want to see Frozen so badly after hearing some of the songs on YouTube (and then buying the entire soundtrack). I'm wacky, I know ;) Did you like the movie? I'm glad your daughter did -- she looks SO sweet. And those curls! Too precious. ...and would LOVE for you to post the pot pie recipe! !